Singapore Airlines (SIA) stories of stewardesses, stewards of more than 10 years by Boh Tong : What's wrong with resting in the seats? What's wrong with resting in the seats? Read the article below concerning passengers' complaints about SQ cabin crew resting next to them. What's wrong with resting next to a passenger? The crew were tired and entitled to a short rest and of course there wasn't any crew bunks on this B777 aircraft. SQ was short of aircraft or may have considered it not appropriate to deploy larger planes with crew bunks on this sector. Therefore, SQ allowed the cabin crew to take a short rest on the passenger seats. 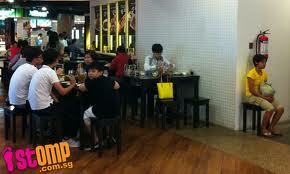 These are the same type of people who disallowed their maids to eat at the same table with them (see picture below). Please la give them some dignity. They are human beings just like you and me. They dun wanna be cabin crew or maids if given the choice. Of course they prefer to be ceos, ministers, chairmans of big companies or the filthy rich etc but circumstances did not allow them. Passengers and Stinkaporeans in general love to complain and grumble. These are the most unhappy people in the world. They also want others to be in the unhappy state like they are in. They have mouths like chicken backsides. Go to hell and fly other airlines la. Wah I was told by some Ang Moh airline crew that passengers dare not even complain about them drinking alcohol while on duty. Hello, drinking wine to them is like drinking water to us la. I was told by a supervisor that while attending to a complaint from a Stinkaporean passenger, he was asked to kneel down and not stand and talk to that passenger....what rubbish was that! Then you have those who woke up the crew to demand for service. They could have easily asked those crew who were not resting. These type of passengers were the ones who think their 5 cents was like bullock cart wheels that big, so to speak in Hokkien. Alot of these pps and spps are really making a fool out of themselves demanding empty seats next to them or the whole row etc, About 95% are on company ticket and bet you they will travell budget when have to pay from their pocket. The best part of this is that they threaten that they know big boss and will sack crew etc and when they harrass crew and then write complain letter they also know that sq will give them something and as usual even if crew was right the management will not believe them and demerit points follow. This is what we call trusting your staff by the mid and senior management.I wonder if the CEO of the companies that the pps and tpps are from actually know HOW THEIR STAFF ARE BEHAVNIG ONBOARD bullying crew and always demanding the world if possible and whether our CEO is aware. Now how do you expect our management to behave especially those who have never worked even for a few years and travel in First Class. Worst then coach class passengers. How can passengers respect crew when our management also treats us like dirt. I am very upset when I read about the complaints made against crew who rest in passenger seat. Why are people so heartless? Even demanding for service when the crew are resting. Stupid Singaporean like that Mr. Tan who complained. BT,I believe the pax who highlighted this had actually done us a favour.All along we felt that it is not appropriate for crew to rest in the cabin within the prying eyes of the travelling public and we have to suffer in silence with no one to speak up for us until now.Top management has got no sympathies for us and only care for their own KPI.Union has got their own constraint and under the umbrella of NTUC they can't do much.This is the story of being a worker in Singapore we call home.No voice.no rights and subjected to the bullying of the employers. In my opinion, Mr Tan did a good job by voicing out his opinion. If u read carefully and in between the lines, its not about just crew resting on the seats..its also about the image and the welfare of the crew. No one really knows how hard a crew works unless when one is in it. The question now is that why was the horizontal rest was taken away from the crew as were previously given to the crew? What horizontal r u talking about? This is an AKL sector which is slightly above 14 hrs duty time and the rest period is only 45 mins. For flights above 14 hours duty time, 3 hours horizontal rest is mandatory. Failure to provide such rest is an infringement under CAAS regulations. Crew also entitled to 2 and half times IFA. Akl/SIN vv duty time is below 14 hrs so no horizontal rest is required. Show no empathy and compassion! End of the day, welfare n morale of one is important, be it whatever job one is in as its one's rice bowl. Its not just on whether its a horizontal rest or not for the cabin crew. In this case, its always about the image of the crew as its the major marketing tool. Thus, something indeed needed to be done about crew resting together with the passengers. I find it really funny when one compares crew and a maid in a similar way as both are working in different environment. On ground, one can freely move around but on air, things are different (tho i am sure one will say oh both does the similar role eg. cleaning of toilets) But then again, if its gonna cost the company financially just for a little comfort for the employees, i doubt any improvement is going to happen anytime soon.